White Sticks are more than just a white stick. You will see people with white sticks or canes and not realised the differences between the three different types. stick users are very independent and sometimes appear rude when offered help. Most users will welcome help, particularly in busy areas. When you assist a blind person let them hold onto you and you guide them by example: don't grab hold of yhem and propel them forward. Obviously if you talk as you walk giving advice about traffic conditions it helps, so that the user is more aware. 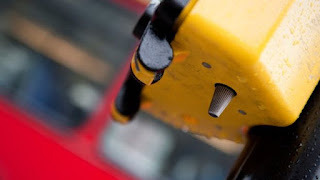 addition many have a revolving fitting built into the pole that blind people can feel moving when they can cross. Under the control box is a metal cone with tactile ridges. This rotates when the lights show red. Try it for yourself. A point to remember, however, is that you should not start walking on feeling the movement, but use your other senses too, listen for moving traffic. The second type of cane is the guide cane, and used diagonally across the body to feel for obstacles. The third type is the tapping cane and is used to probe from side to side seeking out obstacles. You will see on ramps and pathways that there are upstand edges. These stop wheelchairs and buggies wandering of track but are also useful to long white stick users as they can feel the edge. Edges should be 100mm high to comply with the legislation. Blind people have used canes as mobility tools for centuries, but it was not until after World War 1 that the white cane was introduced. In 1921 James Biggs, a photographer from Bristol who became blind after an accident and was uncomfortable with the amount of traffic around his home, painted his walking stick white to be more easily visible. In 1931 in France, Guilly d'Herbemont launched a national white stick movement for blind people. On February 7, 1931, he symbolically gave the first two white canes to blind people, in the presence of several French ministers. 5,000 more white canes were later sent to blind French veterans from World War I and blind civilians. In the United States , the introduction of the white cane is attributed to George A. Bonham of the Lions Club International . In 1930, a Lions Club member watched as a man who was blind attempted to cross the street with a black cane that was barely visible to motorists against the dark pavement. The Lions decided to paint the cane white to make it more visible. In 1931, Lions Clubs International began a program promoting the use of white canes for people who are blind. The first special white cane ordinance was passed in December 1930 in Illinois granting blind pedestrians protections and the right-of-way while carrying a white cane. The long cane was improved upon by Richard E. Hoover, at the Valley Forge Army Hospital. In 1944, he took the Lions Club white cane (originally made of wood) and went around the hospital blindfolded for a week. During this time he developed what is now the standard method of "long cane" training or the Hoover Method. He is now called the "Father of the Lightweight Long Cane Technique." The basic technique is to swing the cane from the center of the body back and forth before the feet. The cane should be swept before the rear foot as the person steps. Before he taught other rehabilitators, or "orientors," his new technique he had a special commission to have light weight, long white canes made for the veterans of the European fronts. While the white cane is commonly accepted as a "symbol of blindness", different countries still have different rules concerning what constitutes a "cane for the blind". 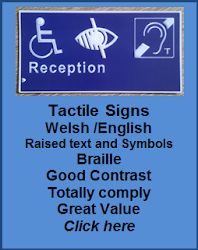 In the United Kingdom, the white cane indicates that the individual has a visual impairment; with two red bands added it indicates that the user is deafblind. In the United States , laws vary from state to state, but in all cases, those carrying white canes are afforded the right-of-way when crossing a road. They are afforded the right to use their cane in any public place as well. In some cases, it is illegal for a non-blind person to use a white cane with the intent of being given right-of-way. So there you have information about white canes and some background history too. Your comments, questions and suggestions are welcome in the comments below.